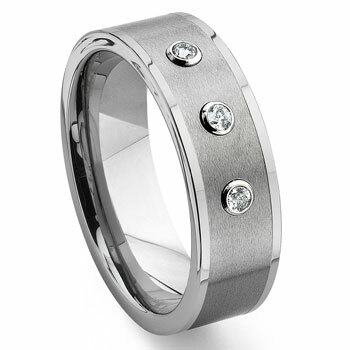 This wedding band has a classic look and feel with a very nice set of diamonds set on the top. The men's wedding band is made of high polish tungsten with a satin finish on the surface with 3 G/H Color 0.17 carat total weight diamonds mounted with bezels to keep them safe and intact for years to come. It is superior in strength as it will not bend out of shape. It is impossible to scratch, will not tarnish like men's wedding bands made of those precious metals. The ring is backed by a 100% lifetime warranty so that you can be assured your jewelry will last an eternity. Our wedding bands also make great gifts for any time of the year and to help celebrate any occasion. I bought this ring for my husband when we got married 9 months ago. He dropped it in the lake a few weeks ago so I had to replace it. It got to us in no time so he didn't go long without a ring! Very satisfied! I can't say enough this ring is great my wife and i could not be happier it looks great! price was unbeleavable! My fiance absolutely loved this ring. It is a little darker in color than the picture, but he absolutely loved it. I dont know much about diamond size and thought the diamonds would be small but they are actually perfect size.